The 2014 GMC Sierra 1500 is a rugged pickup truck designed to offer comfort and convenience while helping workers get the job done. With a tough frame and good gas mileage both in the city and on the highway, this truck is an economical choice for both businesses and outdoor enthusiasts alike. The Sierra 1500 Crew Cab is the most spacious cab available for Sierra. It provides a spacious interior with enough room for an entire crew or family to sit comfortably inside. The Crew Cab has room for 5 passengers, and is available starting at $35,595. The Double Cab also has enough room for five people to sit, but the back seats are narrower and provides minimal leg room. For long trips or restless passengers, the crew cab can be uncomfortable, but the back row functions great for additional storage. The back seat can also be removed to maximize storage space. The Sierra Double Cab is available for $31,195. The Extended Cab removes the second row of seating, reducing the maximum occupancy to just two. However, it leaves more room in the bed for additional storage and is perfect for contractors that work alone or with an assistant. The Extended Cab starts at an MSRP of $27,580. The Regular Cab on the 2014 GMC Sierra 1500 is the entry-level model. It has room for two passengers and comes with a standard-sized truck bed. This model is perfect for contractors that just need to get the job done. This model starts at $27,175. Many luxury cars these days have stylish running lights that help other cars see them and look great on the outside. This year, GMC is the first pickup truck manufacturer to include this feature on the front of the vehicle. Those that don't want to use them can still turn them offer, but this will certainly appeal to many. With a heavy load, getting safely down a hill can be a challenge. The 2014 GMC Sierra 1500 includes a system that automatically manages brake pressure through the anti-lock brake system based on the rate of speed and the weight of the load. It even measures road conditions to prevent an accident during bad weather. As functional vehicles, truck owners generally use their vehicles in unusual places and where many people are walking around. As a result, GMC included a backing camera on the Sierra this year to make backing up on job sites safer. Truck owners can also use this to check that a trailer hitch is safely secured. Through a touchscreen interface, 2014 GMC Sierra 1500 owners can control some of the vehicle's more advanced features without getting distracted from the road. Music, maps, and phones can all be controlled from this interface. The engine includes FlexFuel technology that gives truck owners the flexibility to use either traditional gasoline or ethanol blends. As fuel prices continue to increase, this versatility helps truck owners prepare for a potential crisis and offers them an alternative when fuel prices are high. When hauling heavy loads either with a trailer or in the truck's bed, having a reliable braking system is critical. The Sierra includes four disk brakes standard on all models to help make hauling easier. One core feature that pickup trucks have always lacked was a good way to get into the bed. Many third-party manufacturers have developed tools that can assist with this, but it still has been needed for a long time. The 2014 GMC Sierra 1500 comes standard with a rear bumper that also functions as a step. The bumper step makes getting into the Sierra very simple after a long day of work. Most trucks and cars leave this out, instead opting to include a universal cigarette lighter. GMC realized that most contractors routinely need to utilize AC power from their trucks, so they included a 110 volt outlet standard on all models. This helps when you need a reliable power source for lighting, operating power tools, and charging electronic equipment. The outlet requires that the car be running to operate in order to save on battery life. When working away on job sites, travel time is generally the best opportunity to make calls. Customers, employees, and maybe even your boss can all be called while on the go to make your workflow more efficient. The 2014 GMC Sierra 1500 makes this safer by including a hands-free calling system that automatically takes calls through a Bluetooth system. This can make taking calls easier and safer when trying to navigate through traffic. Whether you plan to use the truck yourself or turn it over to your employees, there's no reason why workers can't have fun on the job. A 7-speaker Bose sound system is available on most 2014 GMC Sierra 1500 models and even includes a subwoofer. Equip with this system, your entire crew will have a great time traveling between job sites. For anyone planning to use the Sierra like it is advertised, a 36,000 mile warranty isn't going to cut it. GMC even throws in two years of scheduled maintenance up to 24,000 miles, which is pointless considering that little damage will occur to the truck's components before at least 60,000 miles. The only things covered beyond this point are the transmission and rust protection, which are covered for five years. When hauling heavy loads up hills or using the truck for pulling, manual transmission is absolutely required. While automatic transmission might appeal to many causal drivers, most contractors need a truck where they can leverage the full power of the engine by being in control of the transmission. In the Sierra, manual transmission is only available as an extra upgrade package. When a person goes to buy a pickup truck, they almost always do so for the extra hauling capabilities or to tow a trailer. The idea that consumers want to carry a truck bed around just for the ascetics is absurd. Apparently the manufacturers had this in mind when for the 2014 GMC Sierra 1500 since the "Trailer Package" is available only as an extra upgrade. 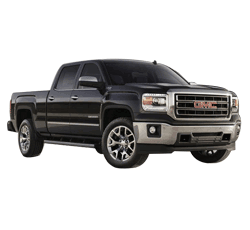 For contractors looking for a great truck that offers the versatility to help in many different work environments, the 2014 GMC Sierra 1500 is a great choice for any tough job.